Jason David Frank doesn’t just play superheroes on TV. He lives it. Jason is most famous for playing Tommy Oliver, the Green and (later) White Ranger in Saban’s “The Mighty Morphin’ Power Rangers” TV show. Soon, fans will see him play the character Bloodshot in the upcoming “Ninjak vs. the Valiant Universe” which is based on the revived Valiant comic book brand. Offscreen, “Fearless Frank” fought in mixed martial arts (MMA) competitions undefeated, set a (since broken) Guinness World Record for most pine boards broken in freefall, collaborated to form MMA clothing line Jesus Didn’t Tap, and works as a martial arts instructor and life coach. In the rush of success, Jason remains down-to-earth. “I don’t really consider myself as a celebrity, although I am,” he told a press conference. This authenticity shows in his devotion to fans. They line up in droves at his autograph table during conventions, but Jason strives to spend time with every one of them. He’s the kind of guy who exudes cool, but also puts you at ease and talks to you like a friend. For Jason, his popularity is a vehicle for blessing other people. As an outspoken Christian, Jason believes that God uniquely positioned him to raise awareness of the need for stronger safety procedures at comic cons. He took time to talk with Legendarium at the Raleigh Supercon about his faith and his new mission. Legendarium Media: What inspired you to become an actor? Were there any movies or performances that influenced your style? Jason David Frank: You know, man, it was just something inside of me, I think. I’ve always been acting up as a kid. I was always drama. I just think that doing something and coming out and just being someone else and getting away from your everyday problems for me was something great. I just loved acting — not necessarily the fame and all that stuff, which is fine, but I’m just saying that I love acting as an artist. I was just drawn to it since I was little. … It was just something that was just inside of me, I was born to do this. LM: When did you become interested in martial arts? JDF: I became interested in martial arts probably at the age of four. I was just walking by a karate school … and I was just captivated. I think just watching karate — no matter if you’re an actor, or what you do — it’s just captivating, you’ll just stop and look and watch. That’s why the new Power Rangers is going to be a hit: because karate — people love karate, beyond anything else. Add colors, add karate, put some cheese in there — kids love cheese — and you’ve got a winner. LM: Could you tell us more about how He has “morphed” your life and your career? JDF: I feel totally blessed, man. I try to put all my worries and everything onto Him. I know He takes care of me, and I know that for a fact even with Phoenix Comicon with that guy trying to kill me. I knew that … [God] was there to stop him, and I knew that God put that on me to make comic cons more safe. That’s just how I felt. I feel that I’m blessed. Once I lost my brother, I kind of wanted to get close and feel and have that relationship with God. God’s always been inside of me, but I [had] never had that opportunity to be in that relationship. … I have a good relationship with God and I’ve been knocked down [and brought] right back up again. I’ve been knocked down so many times that it’s just … how can I get up? Someone’s just lifting me, man, there’s no way I can do it alone. So, I’m blessed. I’ve got the biggest line at comic cons, I’ve got the most honest fans, but I got to tell you: how He has influenced me is me talking to other people, shaking hands like my pastor shakes hands — I never feel in a rush with him. My pastor goes, “Hey, nice to meet you!” He takes the time to shake my hand and that’s how I get through comic cons. I might be a little longer than other actors, but [the fans are] here to share a story —motivational story, sad story — but I’m here to lift them up in spirit, and that’s been my mentality of the “last fan standing” type of thing. LM: About that attempt on your life at the Phoenix Comicon … I was really impressed with how humbly you responded to that. What are some other challenges you face as a believer in the spotlight? 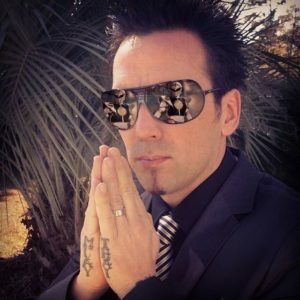 JDF: With the Phoenix Comicon incident … like I said, I felt like God put me in that situation. I’ve been telling people for years something like this is going to happen at comic cons. I still think comic cons need to be a little bit more safe, in my opinion. I’m not going to throw comic cons under the bus, but you have to check people, you have to just look like you’re busy so [dangerous] people won’t come in, because we want to stop it at the door, we don’t want to stop it inside here. Even though I have cops and all, that’s not the point. It’s not the safety of me — it’s the safety for other people. It’s put a whole new outlook to me for people, for my fans, and everything. Comic cons should be treated like every other sport in America — football, baseball — you can walk in with anything [at a con] and no one gets checked. I don’t even get checked. There’s a cosplayer here that came up and said, “Hey, look, they didn’t check my bag,” and showed a gun. This stuff’s still happening. I just think [about] what it’s going to take for them to absolutely put a rule on it, you know what I mean? [They may say,] “Ah, it happened and publicity blew up a bit,” but I’m still going through the court process with this guy. I’m still dealing with the whole thing through September, the courts, so that’s the outlook on that. LM: Any parting advice for Christians aspiring to a career in film business or martial arts? 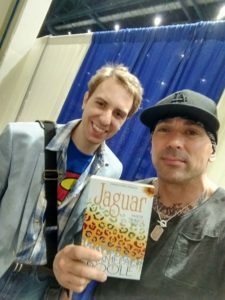 Jason David Frank took a selfie with Legendarium reporter Andy Poole. Jason is holding his copy of the thriller novel “Jaguar” by Pamela Poole. JDF: Yeah, man, I say that you have to practice your art so you can sharpen your sword while everyone else is sleeping. A good warrior is one that believes that he’s going to get through with the help of my Savior, and also at the same time you’ve got to sharpen your sword so that when you have that opportunity or have that fight or have that war, you’re ready to go and not just “I want, I want” and then someone says, “OK, cool, let me see what you’ve got” and all the sudden, you don’t have the tools. You’ve got to practice, practice your tools, do the best you can, and just believe. You can’t ask for something. It’s already destined. You’re already here. Like, this is an appointment for you to meet me here. It’s not by coincidence, or persistence, or reaching out … God made this happen. We’re backstage, I’ve got to go run the table, but this is an appointment by God, not by you or emails or what kind of person I am. It doesn’t matter. It’s just an appointment, a Divine appointment from God. So, if you’re meant to be and do that, then you will succeed. … There are things that you’re inspired to do but that’s just not what God wants you to do. And you’re like “Aaaaah I really want to be a singer!” But God’s like, “That’s not what you’re going to do today. I’m going to give you this job.” And it might not be the best job in the world, but as long as you feel good about it and know that God’s got your back then there’s going to be something big. You’ve got to believe, and you’ve got to practice. That’s just my opinion.